I have found that the right pillow is a key part to getting a great night sleep. There are many types of conventional pillows; some of the more popular are polyester filled pillows, down pillows, and memory foam pillows. In contrast organic pillows are composed of natural materials like cotton, wool, kapok, or natural rubber. Every organic pillow is different from one another as well as being different from conventional pillows. I will discuss how conventional pillows compare to organic pillows and how to choose which organic pillow might be best for you. One of the most commonly used traditional pillows is a polyester filled pillow. If you don’t know what your pillow is made out of, you most likely have a polyester filled pillow. To be sure, you can check the law label tag. If you are someone who loves a traditional polyester filled pillow then a good fit for you would be a rolled and carded wool pillow. Rolled and carded wool feels very similar to polyester and comes in variety of different thicknesses and firmnesses. We carry wool pillows by Sueno, Hom Organics, and Suite Sleep. A person who likes the feel of a down pillow might like a kapok pillow. Kapok is a fiber grown in a seed pod from a tree. Kapok fiber is very light, soft, and has a very fluffy feeling. It feels wonderful; however kapok can compress over time and lose some of the fluffiness. We carry kapok pillows from Suite Sleep, Purerest, and Sachi. If you like the malleability of a down pillow and like how you can reshape it, for example, with a thicker spot at the neck and a dip at the head, you have two great organic options: a wooly bolas pillow or a shredded rubber pillow. The wooly bolas pillow has small balls of wool that are light, soft, and give you the versatility to manipulate them throughout the surface of the pillow. One can even add more wool or remove it for the perfect loft. Our wooly bolas pillow is made by Suite Sleep, and is our overall most popular pillow. 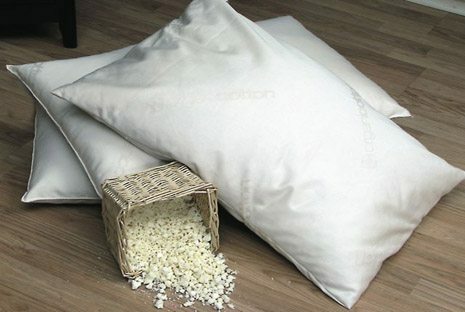 Shredded rubber pillows are made from natural rubber tree sap, which is made into latex foam. The natural latex foam is then shredded and encased in organic cotton to make an extremely comfortable, supportive pillow. Shredded rubber pillows are a perfect option for someone who sleeps in a variety of positions and likes a pillow that you can manipulate the shape of. The Sueno shredded rubber pillow is the most popular; we also love the Suite Sleep and Pure Rest brands. Contour rubber pillows are also made from natural latex and can be compared to a traditional memory foam pillow. The main difference between memory foam and natural latex is that the latex has an instant response and moves with you opposed to the delayed response of memory foam that takes time to move when you do. Both of these pillows are typically made with a thicker part at the neck and a contour down the middle of the pillow for the head. Although a contour pillow can be the perfect pillow because it offers good neck support, it is also one of the hardest to ensure you will get a good fit to your body if you are ordering online, as the thickness of the pillow is different between manufacturers and also different from a memory foam pillow. It would be ideal to try a contour pillow before purchasing. Choosing the right pillow can also depend on which position you sleep in. People who sleep on their back and stomach will need a thinner pillow because they will be closer to the bed and need less support than someone who sleeps on their side. A side sleeper will need the added support and height of a pillow since their head will be further from the mattress. Either a thicker wool pillow or a shredded rubber pillow might be a good option for a side sleeper. A back and stomach sleeper might be more happy with a kapok pillow, a wooly bolas pillow, or a thinner rolled and carded wool pillow. Rolled and carded wool pillows come in different thickness and firmness levels which allow you to choose one that is not too thick or thin but is just right. The wooly bolas pillow can be ideal for many people as it can be molded to comfort as well as adding or removing the bolas to reach the perfect comfort level. If you are choosing a pillow for a child it is important you don’t get one that is too thick. A thin pillow is one that can offer a child support while not causing discomfort to their little neck. An example of a thin pillow could be a kapok pillow or a thin rolled and carded wool pillow. Although it might seem daunting to transition to an organic pillow, sleeping clean and healthy is well worth the money spent and the time to research which might be the best pillow for you. A good place to start is choosing an organic pillow that corresponds with the type of conventional pillow that you have liked in the past.